Thomas Kwesu Tieku writes about the tripartite nature of the African Union and the state of governance in Africa. Drawing on his book, Governing Africa: 3D Analysis of the African Union’s Performance, he argues that the African Union is not impotent in addressing authoritarianism and the democracy deficit in Africa. Manipulation of constitutions and a steady rise in elections-related problems have led to concern that the democratic gains in Africa in the 1990s are giving way to authoritarianism and democratic backsliding. These challenges are not only contributing to the erosion of the peace achieved in Africa in the 2000s, they are widening further the huge gap between the African ruling class composed of old rich men and African masses who are predominantly young and economically-impoverished. A 2018 World Bank study of inequality in 149 countries revealed that 7 out of the top 10 of the most unequal countries in the world are in Africa. What is the best way to address the grotesque inequality, creeping authoritarianism and the security deficit in Africa? For classic comparative political scientists, domestic mobilization aimed at enhancing accountable governance institutions in Africa will be the best antidote to the problems. For International Relations (IR) scholars, the ray of hope lies with powerful global actors and institutions. For political scientists, who are situated between IR and comparative politics, a combination of international and internal forces hold the key to addressing the governance gaps and institutional deficits in Africa. 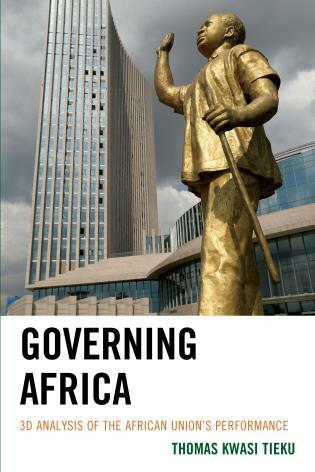 My new book, Governing Africa, is situated at the intersection of IR and comparative politics but draws attention to different international actors. It argues that the African Union (AU) can provide a platform for closing the good governance gaps and the institutional deficits in Africa. Highlighting the AU as good governance promoter is a controversial argument in political science circles. This is because the dominant disciplinary view sees the AU as a monolithic organization created and controlled by African leaders many of whom are unwilling or unable to protect and strengthen democratic governance institutions in their countries. The first part of Governing Africa therefore sets-out to challenge this conventional and monolithic view of the AU by disaggregating the Pan-African organization into three parts. As a tripartite organization, the AU comprises of African governments, international bureaucrats (called Africrats in the book) and the outside-insiders (referred to in the book as Outisiders). Outisiders are actors and institutions that are not formal members of the AU but their ideas and views shape practices, directions, priorities, and policies of the Pan-African organization. They include former heads of state, respected retired African public servants, selected African Think tank organizations, carefully screened academics and independent consultants, and independent commissions created by the AU and some external agencies including the European Union (EU) and the United Nations Organization (UN) missions to the AU. The AU of governments has 55 members and led by the Chairperson of the AU. This AU is conservative and seeks to protect governing regimes in Africa and therefore reluctant to strengthen accountable institutions. The AU of Africrats has over 1000 members under the Chairperson of the AU Commission. This AU is relatively progressive as many of its key actors hold idealist views and are committed to creating a new social contract for Africa based on democratic ethos. The membership of AU of Outisiders is fluid and many of them tend to push the AU to promote goals that serve common interests of Africans, including pressuring the AU of governments to strengthen accountable institutions. Thus, while the three AUs have symbiotic relationships, they often pull the union in different directions. Governing Africa shows that Africrats in collaboration with Outisiders made the AU develop several innovative democracy promotion and defense tools, including the African governance charter, anti-coup norms, election observations, and mediation to defend African democracies and spread democratic values across Africa. The tools were used to fight classic democratic backsliding, including forcing a return to constitutional rule in countries such as Guinea-Bissau, Sao Tome and Principe, Togo, Mauritania, Guinea and Egypt after military take-overs. However, the AU democracy tools were less effective in preventing new subtle, and complex types of backsliding. The tools could not prevent coup makers like Mauritanian’s Abdel Aziz and Egypt’s el-Sisi from using elections to consolidate their power or prevented democratically-elected leaders like Zambia’s Lungu and Tanzania’s Magufuli from abusing their powers. The limited presence of Africrats and Outisiders at African state level together with the emergence of new authoritarian tactics contributed to the decidedly mixed performance of the AU democracy promotion and defense tools. Governing Africa offers several food-for-thoughts. Beside questioning the monolithic view of the AU, the book suggests that African leaders and their external patrons do not call all the shots as it is often assumed or claimed in political science scholarship. Other actors such as Africrats and Outisiders shape African politics. Moreover, the spotlight put on Africrats and Outisiders is meant to draw attention to other actors that promoters of good governance can join hands with to strengthen democratic institutions in Africa. Thomas Tieku is an Associate Professor at King’s Western University, Canada. Governance in Africa is challenging, particularly governing within an ethos in ‘service to the people’ which alas in many African Nation States is a concept lacking in capacity traction attributed in part to neo-colonial antecedents entailed in Western Indirect Rule which was continued in post independence transactional rent seeking governance structures. Ideally, the AU ought to provide an intense element in moral suasion promoting good governance in service to the peoples which demands the AU recalibrate within as the AU for the most part is an agent for African status quo in governance matters. I applaud your thinking in advancing questions which need to be considered if African Governance is to fully mature in being a governance system in ethos directed in public service.